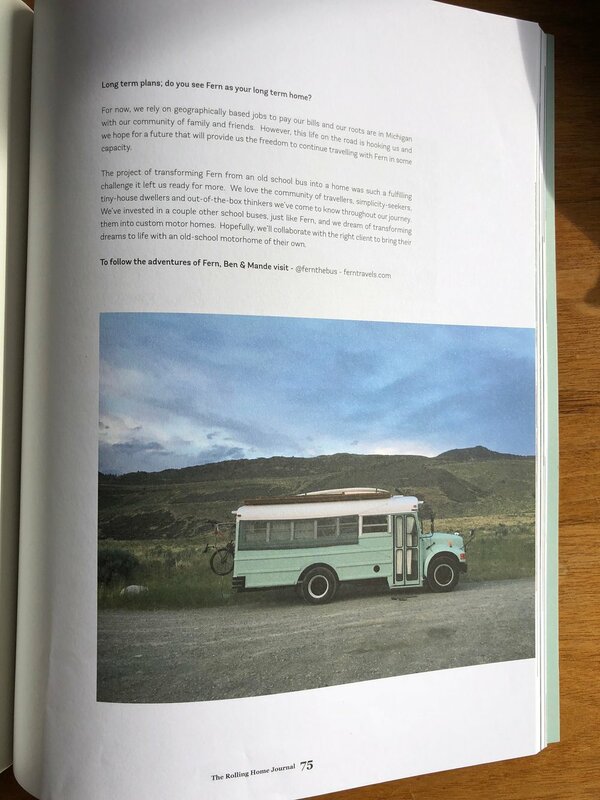 We love The Rolling Home Journal and are so happy to have been published in their third issue. The publication is all about unconventional living, tiny dwellings and rolling homes. The content is quality and the journals are beautifully compiled. It's inspiring to see how many people around the world are living in creative and unique ways. 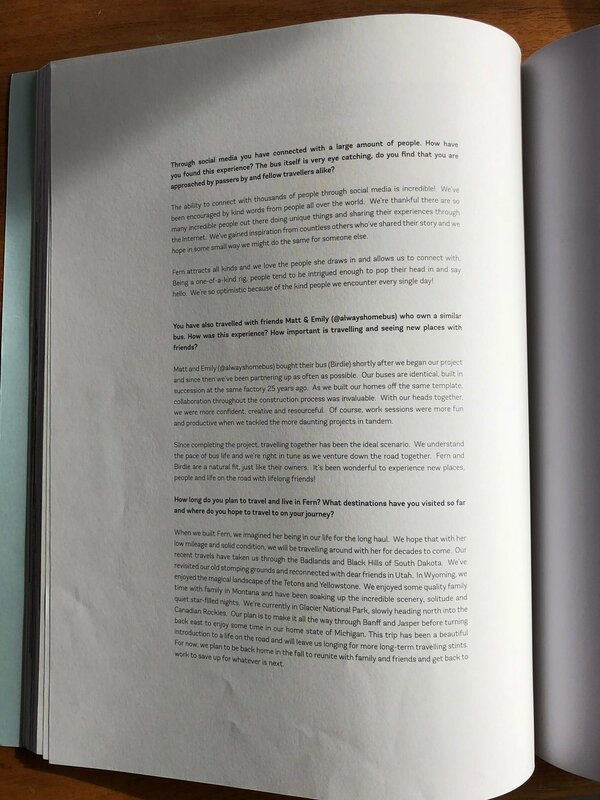 We recommend picking up a journal and reading the whole thing, but thought we'd at least share Fern's feature here. Great to meet you Lauren and Calum, and thanks! "How'd you build that deck on top?" Our bus body, which I expect is similar to other models, has structural steel ribs beneath the sheet metal of the roof. These supports are made of 2" square tubing, and like the rafters in a house, they give the roof strength and rigidity. With 4"x4" posts, the deck is attached directly to these ribs so none of the weight rests on the flimsy sheet metal. I wanted the deck to "float" over the roof like this so water and debris could easily drain. Everything was constructed in cedar because the wood has some natural rot-resistance while being significantly lighter than treated lumber. To begin, I cut a 2"x6" to the length of the deck and mounted it to the center of the roof. I attached it with self-tapping sheet metal screws to every structural rib. Using a forstner drill bit, I recessed the screw heads and made sure to seal everything with plenty of silicone. Next, I cut 4"x4" posts on an angle to match the slope of the roof at the desired height. The galvanized angle brackets I used to attach the posts to the roof were designed to be used for mounting boat trailer bunks, but they happened to work great for this application too. I used a 3" lag screw and fender washer to attach to the lumber, and self-tapping sheet metal screws to attach to the roof. Again, I made sure to apply excessive amounts of silicone. Once the series of 4"x4" posts were installed (seven on each side), I attached a 2"x4" to run the length of the deck (cut to the same length as the previously installed 2"x6"). I held it to match the height of the posts, and mounted it with 3" deck screws to each of the seven posts. These 2"x4"s, combined with the center-mounted 2"x6" will provide the support for our deck boards. From here, it's just like any other deck—throwing down deck boards and screwing them in place! Once the ladder was installed for easy access, we had space for all kinds of activities! With the gift of the year's longest duration of daylight, we broke from our sedentary state and took to the road. Through Chicago's sprawl we fed nagging tolls and drove through construction barrel funnels where a dizzying traffic dance held us hostage. White-knuckled and constantly clutching between gears, we made made it through the mess and were finally going west. The miles fell off quickly then, on broad and spacious highway. The sun went down as Wisconsin farm fields sprawled in every direction. In the dark, traffic faded to nothing but the brief passing camaraderie of a barreling big-rig. Swarms of fireflies swirled over my headlights, periodically exploding on the windshield like a burst glow-stick. A fox darted through my path and looked back with an intelligent glance before trotting down into cattails. Heavy equipment groaned and chiseled away at stubborn concrete on the roadside. The late-night road crew swarmed, resembling fireflies in their reflective neon suits. As man and machine labored into the night I felt gratitude for the perfect line of never-ending pavement ahead. As we hurled through the night, Minnesota lightning began to curl and flash in the distance. Soon the storms surrounded us with a mesmerizing display. Tall towers of flashing red stood, eventually surrounding us like a strobe-light forest. White bursts of lightening revealed them to be massive windmills, methodically grinding out their duty under the cover of darkness. I love the road—the energizing anticipation of the unknown—of something new and untold. I love fueling up with the semi-trucks, shooting the breeze and buying 20 ounce coffees alongside fellow drivers in the wee-hours of morning. And there's something to be said of the good ole interstate rest stop, where one can pull off into a quiet corner when eyes grow tired. After shutting down the engine around 4 AM, I took a couple steps and fell into comfortable sleep in my very own bed.